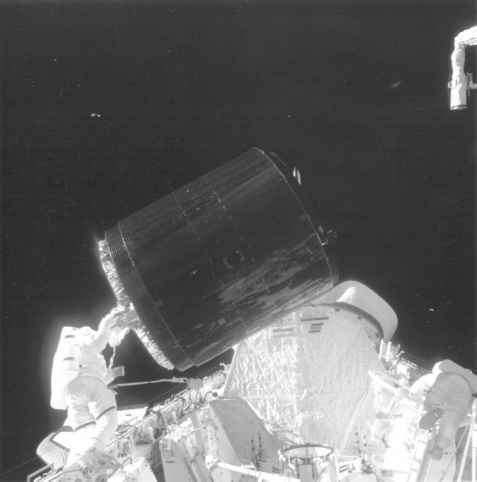 Allen emerged head first out of the airlock on the first EVA and, to his astonishment, found the Palapa satellite floating just beyond the bulkhead of the orbiter. Only a short time before, when they looked out of the window prior to suiting up, the satellite had been a bright spot 100 km away. Now they were parked barely twelve metres (forty feet) away from the satellite, whose rotation had been reduced from 40 rpm to a more sedate 2rpm. 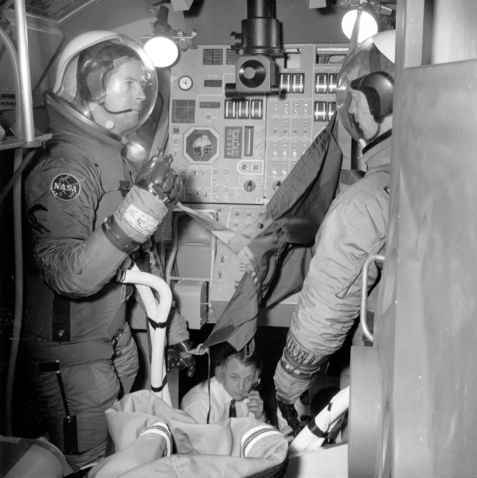 After donning and testing the MMU, Allen flew over towards Palapa, feeling none of the jerks and jolts that the simulator on the ground had produced. As he rounded the back of the satellite to the kick motor end, he was dazzled by bright sunlight and he thought he would have trouble seeing the docking. Allen, tethered to the foot restraint on Discovery's robot arm, holds onto the Palapa B-2 satellite with his right hand while Gardner works to the right of the frame. He knew from Palapa's silhouette that he was heading in the right direction - and at the right rate - when suddenly he entered the shadow of the satellite, clearly viewing the nozzle and where he was to place the stinger. After achieving a temporary soft dock, he activated the device to achieve a hard dock, calling to his colleagues back in the Shuttle to stop the clock as he had captured the first satellite - much more easily than he thought he would have done.